We drove through Bishopville, SC on July 26th, 2015, one full week before the Lizard Man decided to come out of hibernation. Figures. Not only was the Lizard Man nowhere to be found, all of the non-chain stores were closed due to the town's quaint blue laws. 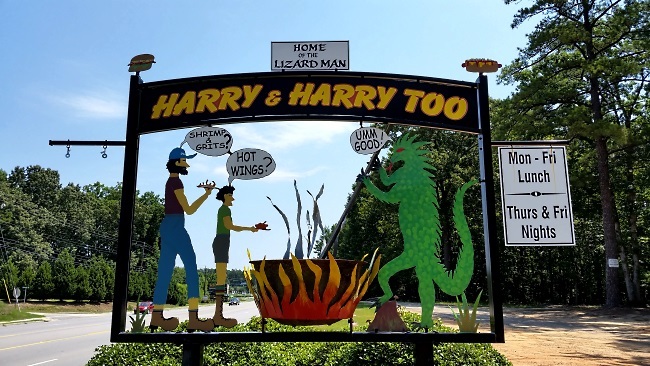 So while we weren't able to step foot in Harry & Harry Too, we were able to check out their sign, which depicts the Lizard Man cooking a witch's brew of shrimp, grits, and hot wings for the freakishly long-legged citizens of Bishopville.